NBA: LeBron James came up big down the stretch and scored 29 points, Dwyane Wade added 24 and the visiting Miami Heat beat the Chicago Bulls 85-75 Wednesday night to tie the Eastern Conference finals at one game apiece. The Heat can breathe a little easier after escaping with a win and stealing home-court advantage. Coming off a lopsided loss in Game 1, they recovered down the stretch after blowing an 11-point lead to pull even in the series. James shook off a brutal opener and scored nine points over the final 4:27, starting with a 3-pointer that put Miami ahead for good, 76-73. 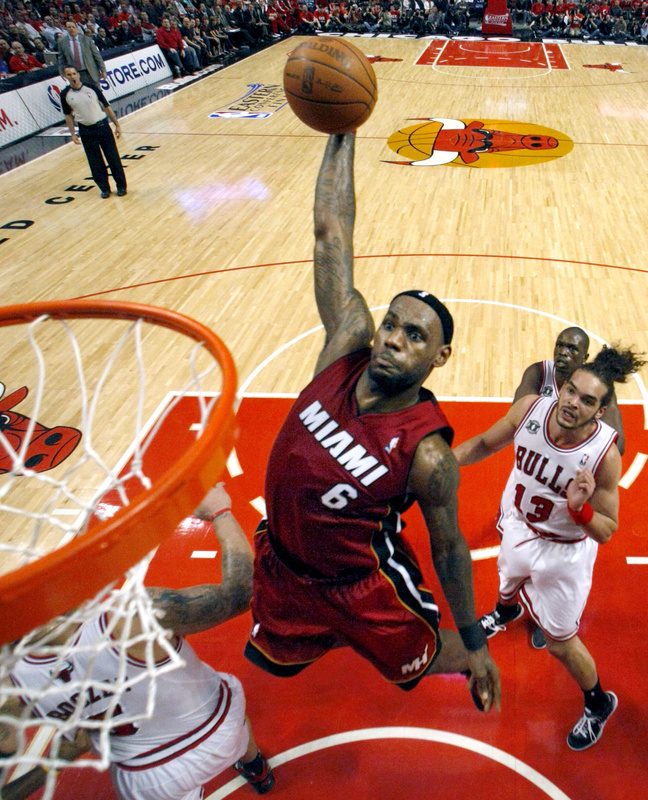 He also had 10 rebounds, and Miami outrebounded the Bulls 45-41 after getting pounded 45-33 on the glass in the opener. It was big turnaround after he managed just 15 points on 5-for-15 shooting while being harassed by Luol Deng in Game 1. Wade also looked more like a superstar after scoring 18 on Sunday. Udonis Haslem provided a spark off the bench with 13 points, and the Heat beat the Bulls for the first time this season even though Chris Bosh scored just 10 after pouring in 30 in the opener. Derrick Rose led Chicago with 21 points but scored just two in the fourth quarter. Deng, the other Bulls player in double figures, added 13 but had just four after the opening period. NHL: Daniel Sedin scored his second power-play goal of the game, and Chris Higgins and Mason Raymond added man-advantage goals in the third period for the Vancouver Canucks, who routed the San Jose Sharks 7-3 at Vancouver, British Columbia, and took a 2-0 lead in the Western Conference finals. Defenseman Aaron Rome also scored his first NHL playoff goal with 5:30 left as the Canucks poured it on late. The game turned when Kevin Bieksa scored the go-ahead goal on a breakaway with 7:55 left in the second period. Game 3 of the best-of-7 series is Friday night at San Jose. College football: NCAA President Mark Emmert told the Justice Department that its questions about the lack of a playoff system for college football are best directed to another group – the Bowl Championship Series. Cycling: Frenchman John Gadret used a late attack to win the 11th stage of the Giro d’Italia at Castelfidardo, while Alberto Contador retained the overall lead. Gadret attacked on the uphill finish with a few hundred meters to go and clocked 3 hours, 33 minutes, 11 seconds over the hilly 89-mile route from Tortoreto Lido to Castelfidardo. He dedicated his victory to Wouter Weylandt on the day of the Belgian rider’s funeral. Joaquin Rodriguez of Spain crossed second and Italian champion Giovanni Visconti was third, both with the same time as Gadret. • Bend cyclist wins stage: Chris Horner of Bend, Ore., powered to a solo uphill win in Stage 4 and assumed the overall race lead at the Tour of California in San Jose. The 39-year-old Horner of the RadioShack team, last year finished 10th in the Tour de France as the top American. He completed the 81.8-mile Livermore to San Jose road race in 3 hours, 27 minutes, 51 seconds. Andy Schleck (Leopard-Trek) of Luxembourg, the 2009 and 2010 Tour de France runner-up, finished second, 1:15 behind. Rory Sutherland (United Healthcare) of Australia was third, just behind Schleck. Horner, fourth overall last year in the Tour of California, now leads the seven-day race by 1:15 over teammate Levi Leipheimer of Santa Rosa, Calif., the three-time race winner. Tennis: Fourth-seeded Jelena Jankovic of Serbia was upset by Sofia Arvidsson of Sweden 3-6, 6-3, 6-3 at the Brussels Open. It was the latest setback on clay this spring for Jankovic, who failed to progress beyond the second round of three of the four tournaments she has played on the surface. Jankovic reached the semifinals at the French Open three of the last four years. Soccer: Heather O’Reilly had a goal and an assist to lead the United States to a 2-0 win over Japan at Cary, N.C., in the Americans’ next-to-last exhibition before the Women’s World Cup. Hope Solo made three saves in her second straight shutout to help the U.S. claim its second win over Japan in a five-day span and its third of the year.